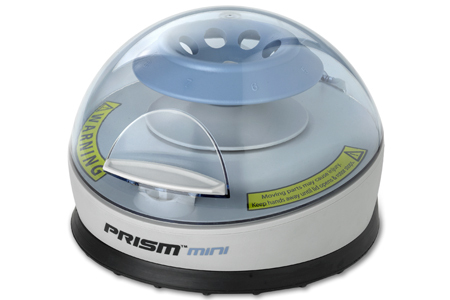 Self-Opening Lid - The transparent blue lid allows for a clear view of samples in the rotor. Start and Stop of the centrifuge can either be controlled by the On/Off switch or by activating the self-opening lid. By depressing the lid button, the lid automatically opens allowing full access to samples. Quick Release Rotors - The Prism Mini is supplied with two rotors. An 8 place tube rotor accommodates 1.5/2.0ml tubes and a 4 place strip rotor accommodates 4 x 0.2ml tube strips or 32 individual PCR tubes. Each rotor features a quick release design allowing for the rotor changes without the use of tools. Simply snap off and snap on to change between applications. Rapid Braking - The brake system in the Prism™ Mini is controlled electronically. Once the lid opens, it signals the brake to activate so that the rotor will come to a quick and soft stop without disrupting the samples.